Sooner or later, every traveller along the Uzbek Silk Road will end up in Tashkent. It is a necessary stop on the way to Kazakhstan, it has a major airport and it is unavoidable if you want to see the Fergana Valley. And while it is true that there isn’t much to do in Tashkent, we quickly found out that there is enough to keep you occupied for a day or two. Even though most of Tashkent has been destroyed by an earthquake in 1966, a little assembly of buildings is still standing. The most interesting ones are located around Khast Imom square. 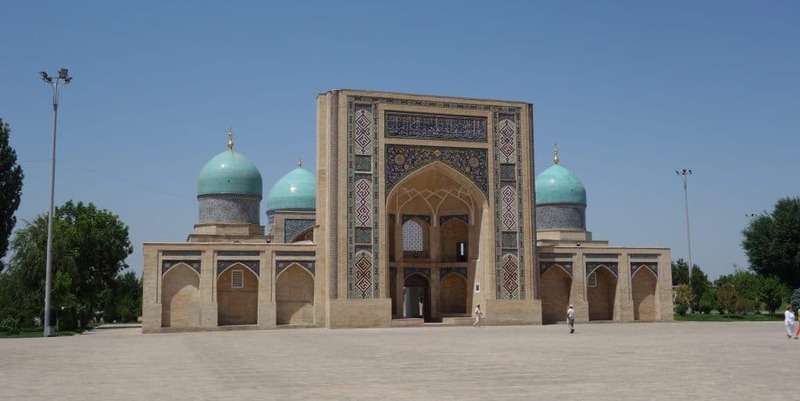 Both the medressa and mosque are nice to look at, though not outstanding compared to other Uzbek architecture. It is the library that houses one of Tashkent’s biggest attractions. Inside, you will find what is said to be the world’s oldest Quran, dating from the 7th century. The book was brought to Samarkand by Timur and is now on display together with a couple of other ancient Qurans. Tashkent’s most important bazaar is huge and you can easily spend an hour or two here, just looking around. It sprawls out over several buildings and whatever you want to buy, you can find it here. From hairpins to fresh raspberries, homemade noodles and spices, the range of goods on offer is huge. Make sure to check out the section of fresh fruits, as you can get some amazing bargains here. 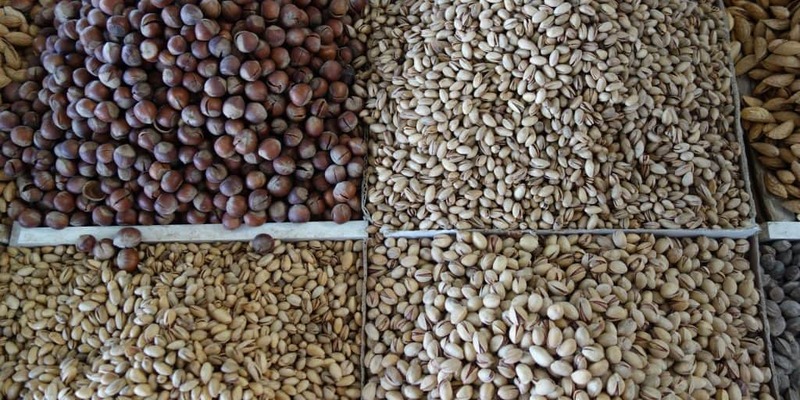 Also, climb the stairs inside the domed building to get an overview of the whole place and to stock up on nuts and dried fruit. When we went to the History Museum, it was mainly to escape the heat. Of course, we wanted to learn about the History of Uzbekistan. But on that hot summer day, the prospect of airconditioning seemed even more appealing than any history lessons. Too bad that the aircon was broken when we got there. We still went inside, spending a good amount of time on the second floor and looking at the relics of ancient Uzbek history. Then, we made our way up to the third floor, expecting an exhibition of modern history. What we found instead was an exhibition about the greatness of Uzbekistan and its oh-so-amazing president. I highly recommend you to come here and see for yourself. 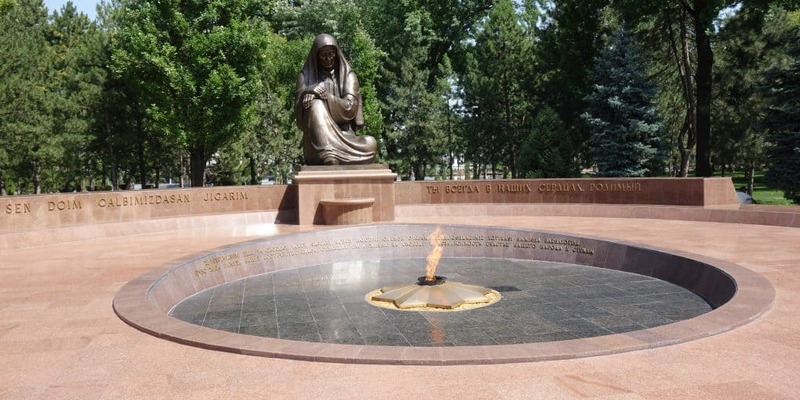 The museum does not only teach about Uzbekistan’s history, but also, if you are willing to read between the lines, about the political situation nowadays. In 2010, Uzbekistan’s president Karimov cut down dozens of old trees in a plan to ‘beautify’ the city. Why exactly the trees had to go, nobody knows. Fortunately, Tashkent has enough parks left with their trees standing. In the heat of the day, this is where you want to be, strolling down shaded alleys. The best place to go for a walk is north of Independence Square. Look out for the monuments along the way, the Earthquake Memorial and the Crying Mother Monument. In front of the latter, you will find an eternal flame. 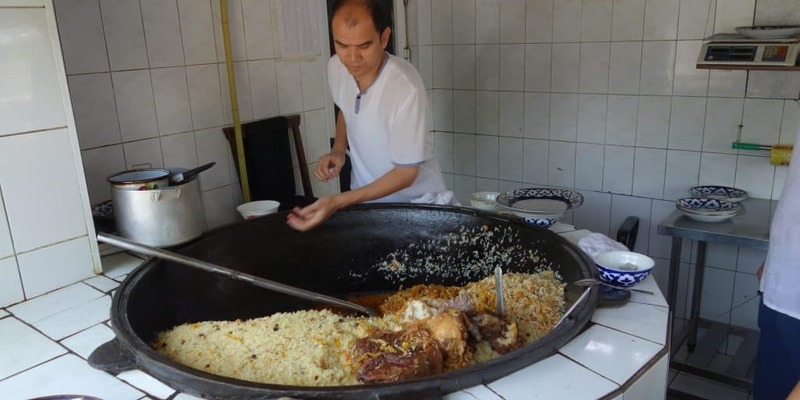 I have already mentioned the Central Asian Plov Centre when talking about the highlights of Uzbekistan and I will mention it here again. Plov is one of Central Asia’s staple dishes and you cannot come to this region without trying it at least once. It consists of rice with vegetables, usually carrots and whatever else is in season. You will find a lot of variations of this dish all over the country, but the one we had in Tashkent was without doubt the best. The seasoning was excellent, it contained a lot of vegetables and they gave us the option to add horse meat on top (we all declined, but in case you wanted to try horse meat, this is your chance). Coming here for lunch gives you the opportunity to rest before going out again to continue exploring the city.